PREMIER PARAFOILS are completely reliable, unbreakable, and require no assembly whatsoever. This strutless design is absolutely the most ingenious ever created for unlimited durability and maximum wind range. Out of the bag and into the air! Packaged with tail, line, and winder in a compact nylon case that you can slip into your pocket. The perfect travel kite! 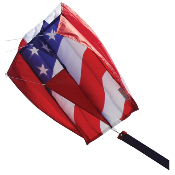 No Assembly - Easy to Fly - Perfect Kids Kite!